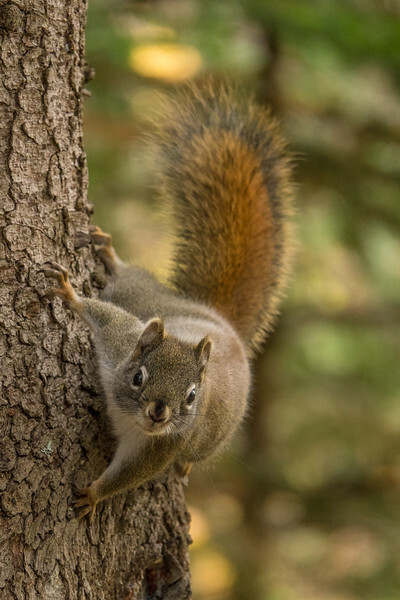 I caught this crazy squirrel the other day as he was running around the trunk of this tree along the High Falls Trail in Grand Portage State Park. Sometimes squirrels act really goofy and this guy was certainly doing just that! 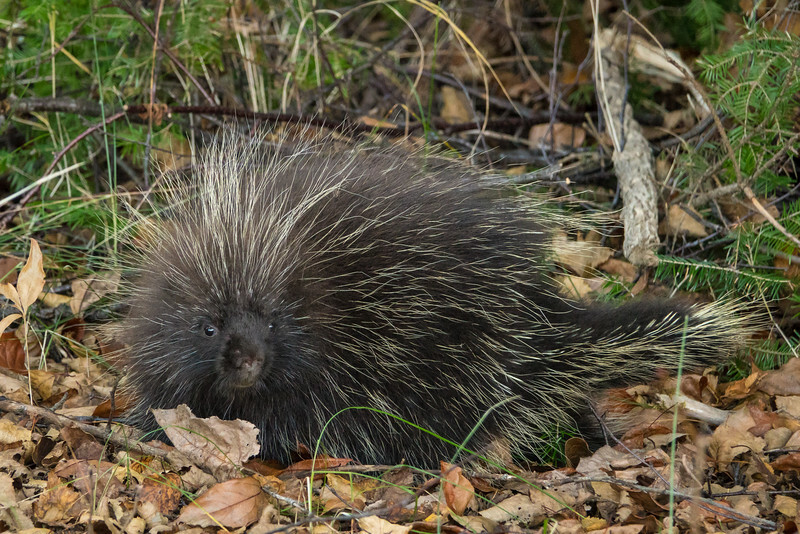 I've always wanted to get a good picture of a porcupine and last night I hit the jackpot! 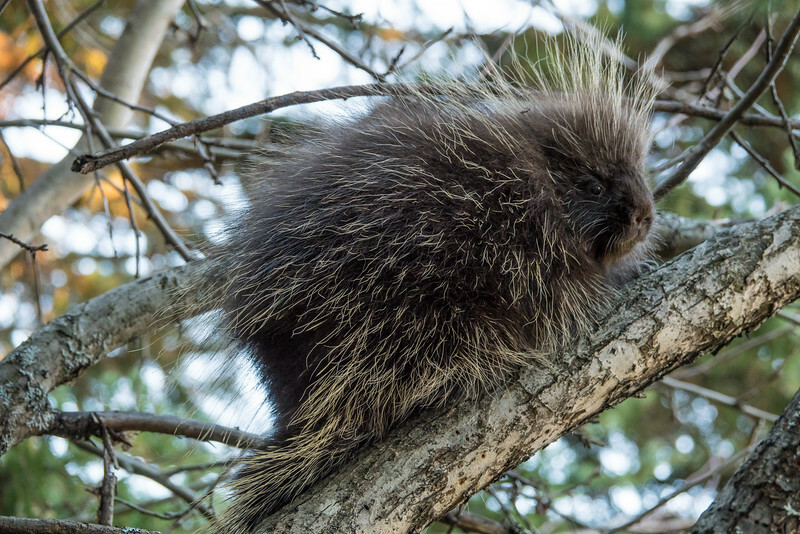 I came across this cute little critter about an hour before sunset and he posed nicely for me in this crabapple tree. I was able to come away with several nice images of him. It was a great way to end my day! 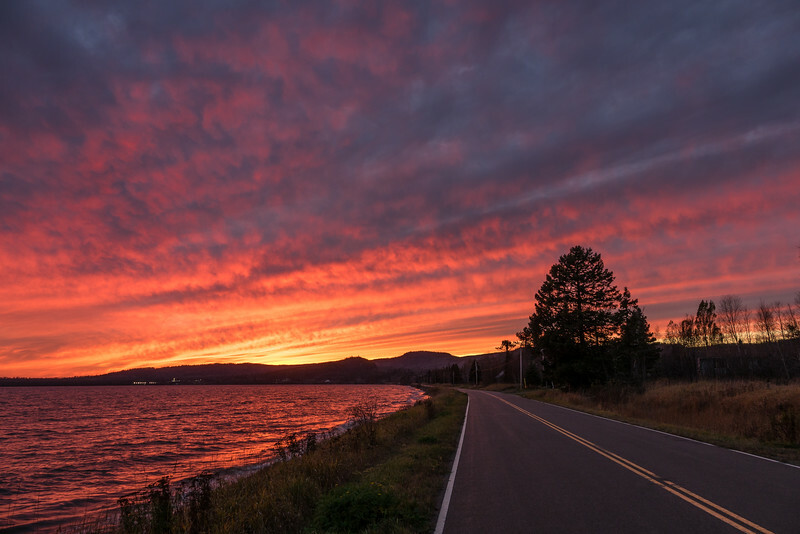 "November Sunset over the Bay Road"
A surprise sunset that turned out awesome last night! I was driving home from work and it looked like sunset was going to be a bust. Since the sky was so full of clouds I figured it would just be gray. But lo and behold, as soon as I pulled in my driveway the sky started to light up. I grabbed the camera and walked 1/4 mile back down the road to make this photograph. 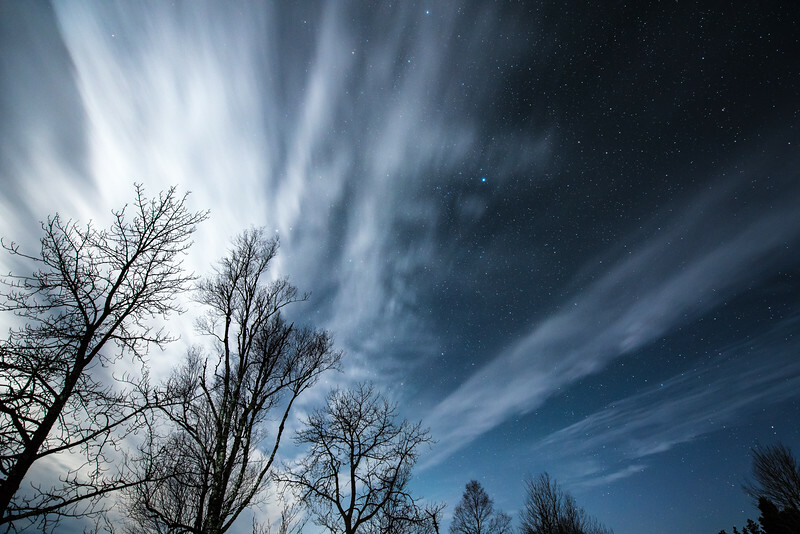 "November Moonlight and the Milky Way"
A couple of nights ago the moonlight, starlight and clouds were sublime. It was an unbelievably beautiful November night. The temperature was very mild for November and the sky was mesmerizing. I went for a 3 mile walk in the moonlight and loved it, soaking up the glory of the night every step of the way. I made this photo just before I started out on my walk. The trees in the lower left are right across the road from our driveway. 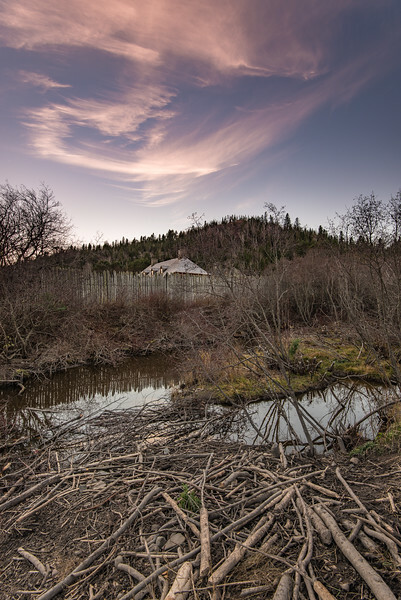 "Busy Beavers at Grand Portage National Monument"
The beavers sure have been busy at Grand Portage National Monument! This photo was made standing on top of the lodge, which is built into the hillside next to Grand Portage Creek. 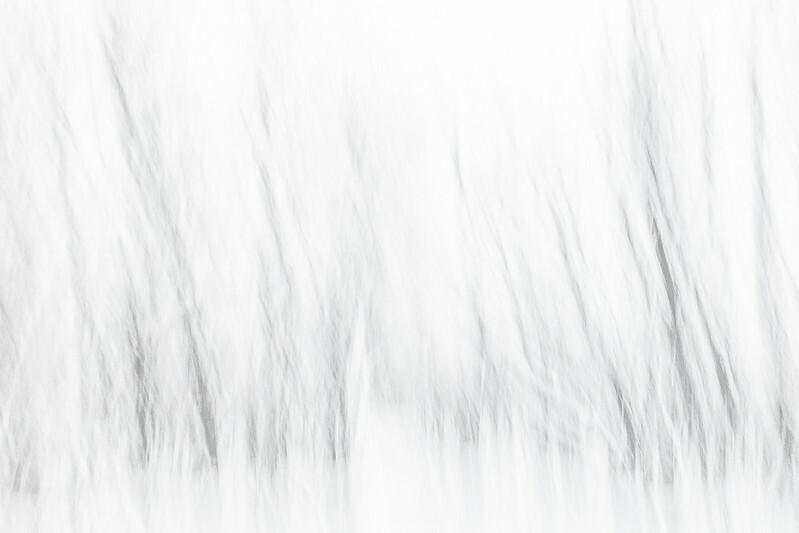 Between the beaver lodge and Mt. Rose in the background you can see the roof of the great hall inside the fort. It's kind of ironic... I don't think this scene would have been possible during the fur trade. The beaver was the main animal that was sought after and had there been some this close to the fort they would have certainly been casualties of the trade. 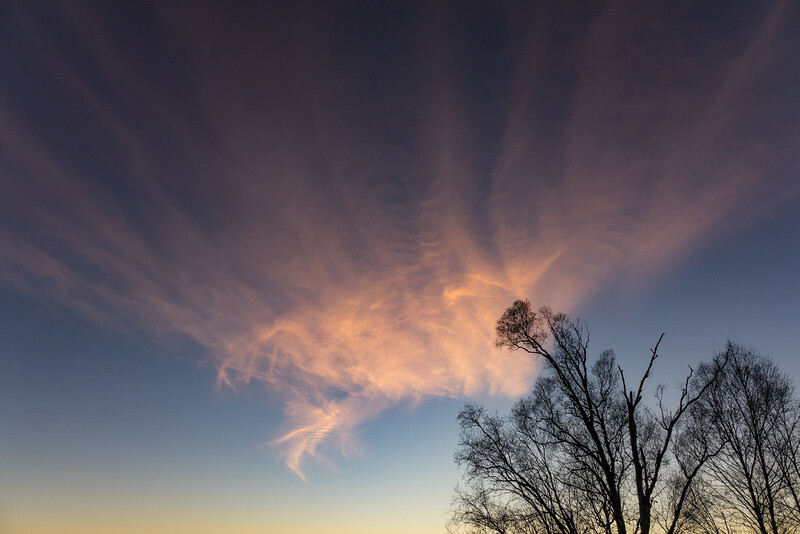 A cool sunset sky from a couple of nights ago. The clouds were really interesting! "November Supermoon, Grand Portage Bay"
Last night's moon was AWESOME. I've actually been out enjoying the moonlight for the past several nights. The first couple of nights I took my fat bike out for a ride and last night I went for a walk in the moonlight. I love being able to do things outside at night and not even really need a flashlight or headlamp because the light from the moon is so bright. 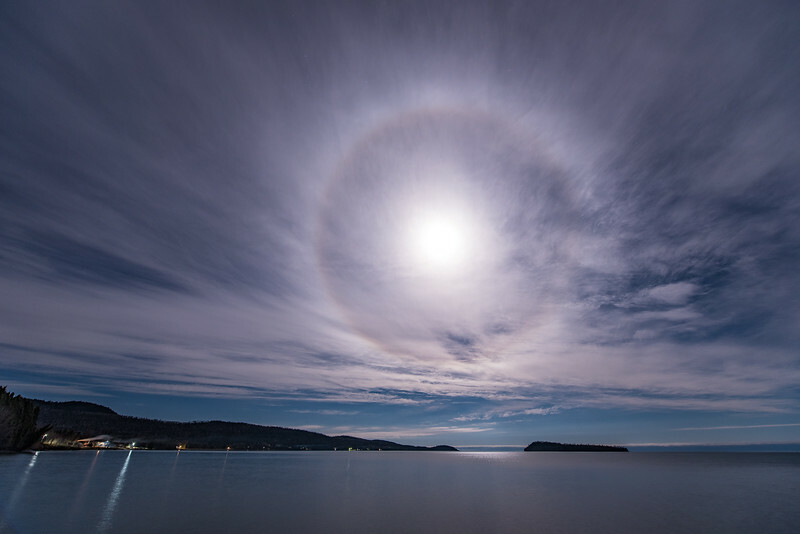 Anyway, last night there was a beautiful HUGE ring around the moon. When I returned from my walk I went back out with my camera and made this photograph looking over Grand Portage Bay. "R/V Kiyi - Grand Marais Harbor"
Yesterday I had to bring a relative to the airport in Duluth and along the way we were lucky enough to see the research vessel Kiyi departing the Grand Marais harbor just as we were passing through town. 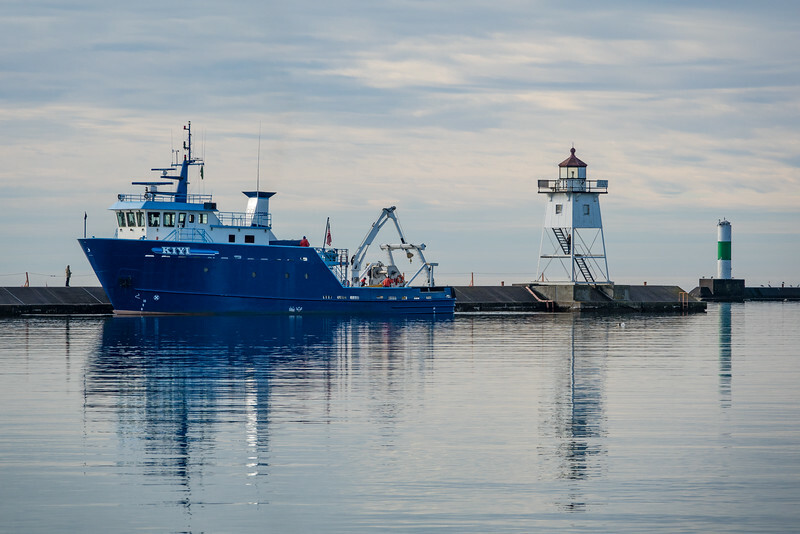 The R/V Kiyi is based in Ashland, Wisconsin and conducts fish stock assessment, fisheries research and habitat monitoring. She was built in 1999 and has a length of 107 feet. She sure is a beautiful ship! 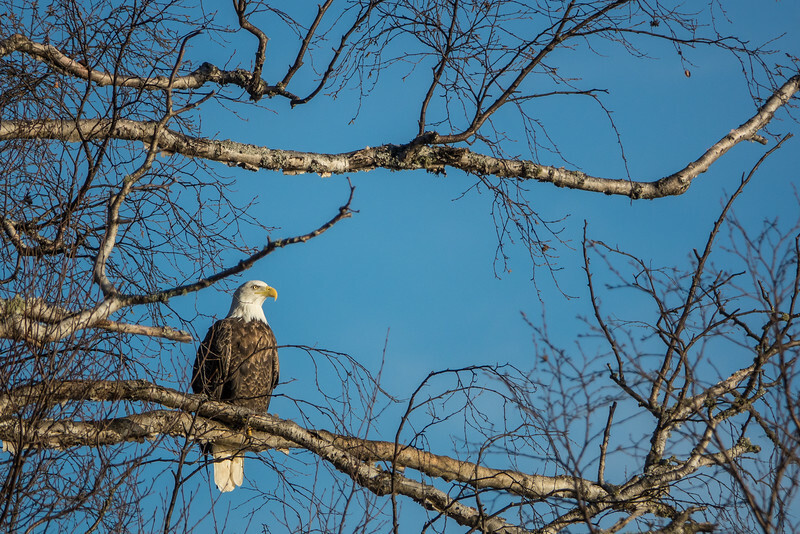 A couple of weeks ago I was driving home from Grand Marais and saw this beautiful eagle perched in a tree overlooking Lake Superior. I always love seeing eagles. A sighting of one always brings such joy to my day! 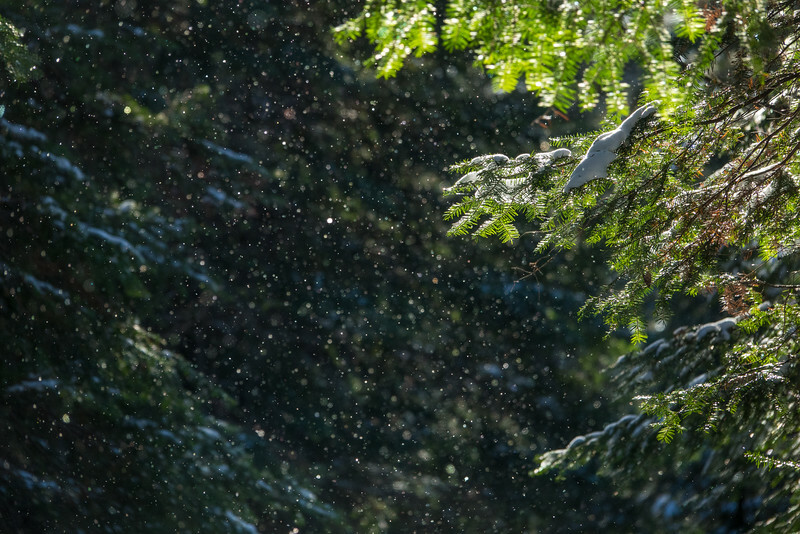 Beautiful back-lit falling snow along the High Falls Trail in Grand Portage State Park, MN. 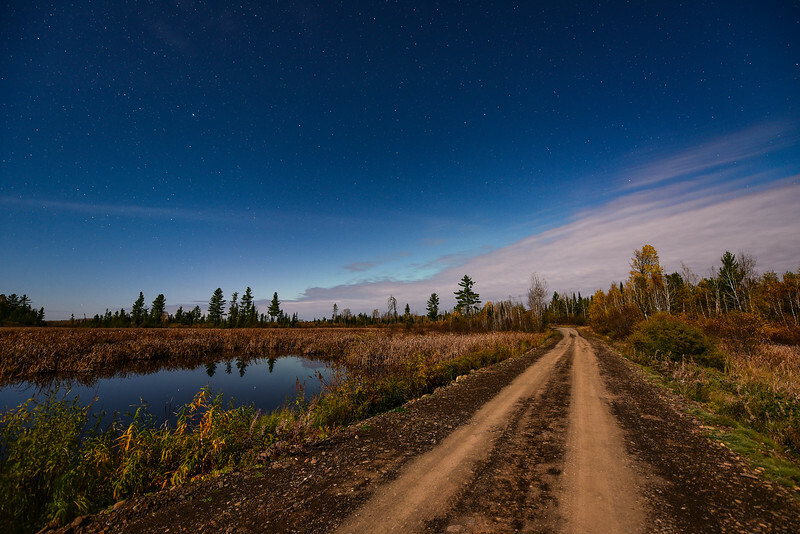 "A quiet night on the back roads"
I made this photograph earlier this autumn along Arrow River Road in Ontario, Canada. I was out looking for the northern lights, which were supposed to make an appearance that night. All I could see in terms of the northern lights was the faintest glow of light coming from behind the clouds. It never got any brighter than what you see in this photo. It was also a full moon that night, which is why the foreground is so bright. 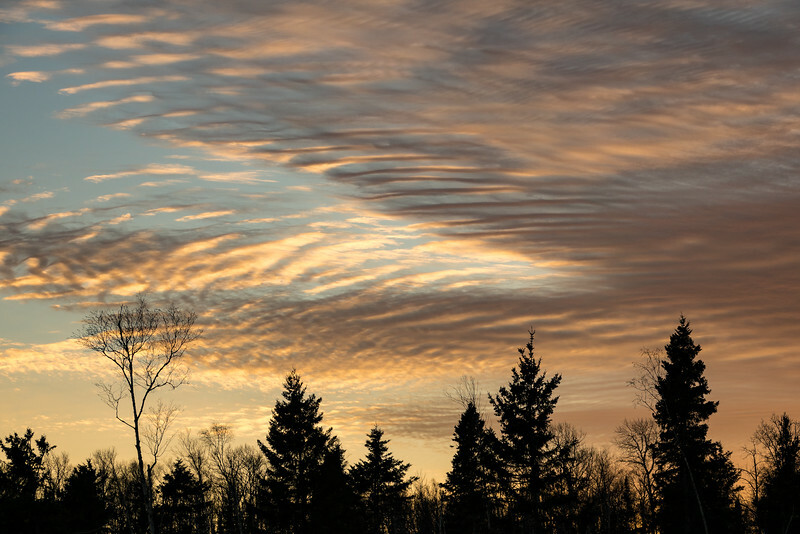 A beautiful November sunset in northern Minnesota.